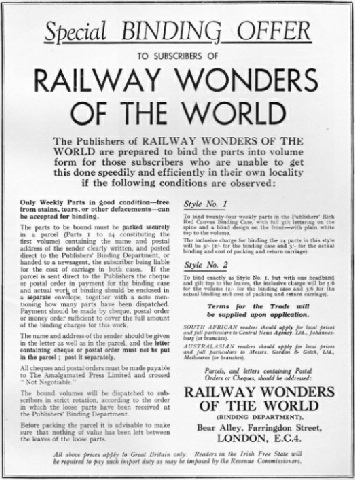 RAILWAY wonders of the world are both many and varied. There are, to mention but a few, the Forth Bridge, the Himalayan Loop Line, the Severn and Simplon Tunnels. They are spectacular and receive frequent publicity. Yet I sometimes think that, because of familiarity, we are apt to overlook what is perhaps the greatest wonder of them all. This is the locomotive itself. I think it will be agreed that the locomotive is certainly the most important of the railway wonders. I find from my correspondence that while the interests of railway enthusiasts are catholic and embrace everything that can have any connexion with the railway, yet most of the letters show a greater interest in the locomotive. And I also find that some of the most popular chapters I have published are those which deal with locomotives and locomotive history. yet published. Next week’s chapter will describe a visit to one of the largest, and certainly one of the most famous, locomotive shops in the world. This is Swindon, where the famous “King” class of locomotive is built by the Great Western Railway. Part 24 will also contain a complete chapter which will have a special appeal to the layman and to the expert. This will be entitled “Carrying the Seasonal Crowds”, and will deal with passenger facilities on the grand scale. There are the trains which are run for holiday excursions. There are trains that start from all parts of England, Scotland or Wales for the Football Association Cup Final at Wembley. There is the train that can be hired by private firms for outings. There is the special train run for an important race meeting; and in this connexion we can judge the importance of seasonal traffic, for at Aintree, during the Grand National, trains arrive, between 11 am and 1.30 pm, at the rate of one every two minutes. The handling of this special traffic calls for remarkable feats of organization, and that it is so successfully carried out reflects great credit on the railway staffs concerned. This chapter next week will contain many facts hitherto unknown to the general public, and will take the reader behind the scenes where some of these train journeys are being organized. THE chapter that I published in Part 4 on “Aerial Railways” was extremely popular, and I know from my correspondence that any further information on this fascinating subject will be welcomed. Next week I shall deal with the famous Gran Sasso cableway, which takes the traveller 6,929 ft up to the Gran Sasso, the highest group of Italian mountains south of the Alps. This chapter will include a description of another famous Italian cableway, the aerial line from Clavidres to Pian del Sole. 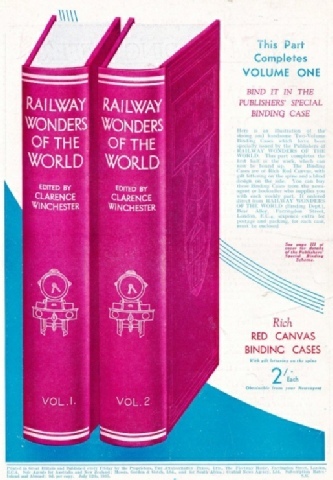 Included in next week’s issue of Railway Wonders of the World will be the continuation of the chapter on the railways of Ireland, which begins in this issue. This chapter will contain a description of one of the most interesting railway inventions of recent years. This is the Drumm Traction Battery, which has operated eighty-ton suburban trains on the Great Southern Railways for some years. At the moment, track electrification in Ireland is not considered an economic possibility, but the Drumm train, with its quick-charging battery, is claimed to have rendered excellent service. Trial runs proved that within less than a minute after starting the Drumm train can attain a speed of fifty miles an hour. Part 24 will contain a superb colour-plate of a Great Southern Railways train leaving Kingsbridge terminus, Dublin, drawn by a 4-4-0 passenger express locomotive. The Great Southern came into being in 1925, on the amalgamation of several companies. It is the largest Irish railway, and its route mileage, all in the Free State, is 2,157. THIS week’s cover shows the “Flying Scotsman” leaving King’s Cross Station, drawn by No. 2563, “William Whitelaw”, one of the well-known 4-6-2, or “Pacific” three-cylinder express locomotives. In summer this train runs 392·7 miles non-stop between King’s Cross and Edinburgh in seven and a half hours - the world’s longest non-stop run. During the rest of the year the train takes seven and three-quarter hours down, and seven and two-thirds hours up, stopping at Grantham, York, Newcastle and Berwick-upon-Tweed, and - on the up journey - at Darlington.